A short walk from the parking lot will bring you to a canyon that will feel like you’ve left the city more than Whitecourt. This is an easy hike but the canyon leaves plenty to explore while you’re down there. The stairs getting into the canyon can be a bit steep when it’s snowy – but it’s a short trek worthy of all season exploring. Closed October to April. Go early or late in teh season! There’s magic at the end of this trail in an easy 4km trail to the falls, where you can explore in and around a frozen wonderland through the winter months. The trail is easily enough for children, and short enough, but flat enough to pull along a sled (with a few small hills that you can play and slide on, spicing things up a little bit). Guided tours are available for families with older children 7+ at Maligne Canyon, and it’s a really fun experience. 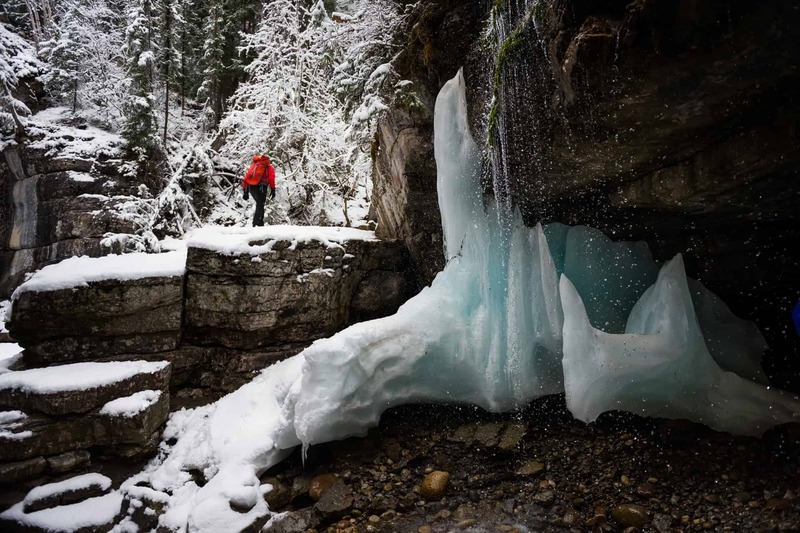 From drinking from a spring nearing the end of the trail, to seeing ice climbers on the way and getting an entirely new vantage point of the canyon during the winter, it’s a must-do activity in Jasper during the winter months. The walk through Grotto Canyon is magical. It’s a two hour hike through a narrow creek bed, on ice. Hoodoos, caves, and a frozen waterfall makes it one of those winter hikes you’ve got to do with your kids. A little on the longer side of hikes for the winter, we do this hike with kids six and older. Make sure you buy, or rent, ice cleats for everyone going on the hike because a good portion of this hike is over ice! One of the easier hikes with kids during the winter months, you can choose to self guide the walk or take one of the many tours in the area. Icy during the winter and spring, make sure you bring ice cleats along for the walk for kids and adults! We like this option because you can choose to do the lower falls for a shorter hike with younger children, to the upper falls for older kids or all the way to the Paint Pots! What about you? What are some of your favourite places to explore with kids on winter trails outside of the city?